Ingredients: Aqua (Water), Cetyl Alcohol, Lanolin, Stearic Acid, Glyceryl Stearate, PEG-100 Stearate, Myristyl Myristate, Squalane, Distearoylethyl Dimonium Chloride, Tapioca Starch, Simmondsia Chinensis (Jojoba) Seed Oil, Cetearyl Alcohol, Argania Spinosa Kernel Oil, Creatine, Parfum (Fragrance), Phenoxyethanol, Benzyl Alcohol, Hydroxypropyl Guar Hydroxypropyltrimonium Chloride, Sodium Hydroxide, Sodium Stearoyl Glutamate, Hydrolyzed Silk, Disodium EDTA, Ethylhexylglycerin, Limonene, Dehydroacetic Acid, Polymethylsilsesquioxane, Linalool, Benzoic Acid, Alpha-isomethyl Ionone, Citral. Larry King has one of the coolest salons in London and a client list to match, including the likes of Courtney Love, Gigi Hadid and Cara and Poppy Delevingne. 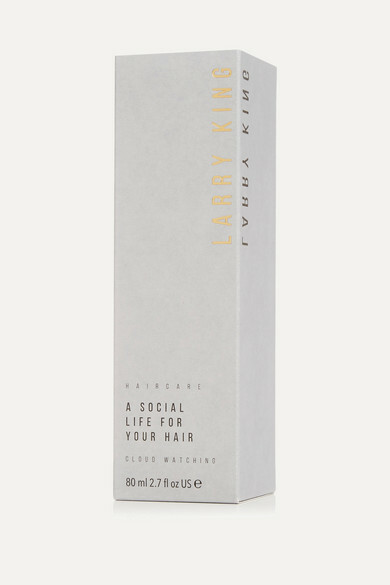 Part of his new product line, this 'A Social Life for Your Hair' finishing cream can be used to tame curls and flyaways or to smooth tresses. It's fragranced with a 'Cloud Watching' scent, which is green, herbaceous and mossy with top notes of Lavender and Bergamot.